First Franchise are working in partnership with White Stores, one of the UK’s largest independent online retailers of garden furniture and accessories, to introduce their outdoor living concessions into garden centres nationwide. White Stores are initially looking to introduce their premium garden furniture & accessories concession into six garden centres across the UK over the next three years. Requiring a retail space of 5,000 sq ft., these White Stores concessions will provide each garden centre with a guaranteed income and additional visitors. 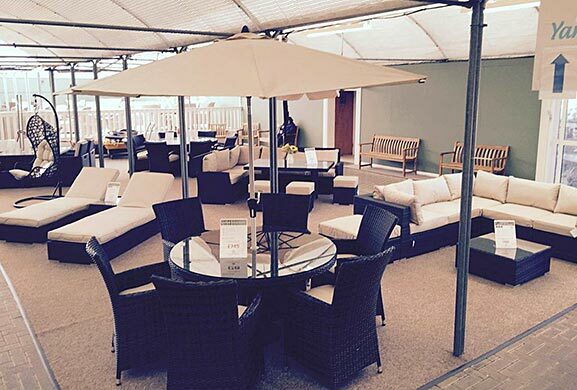 Founded by James Whiteley in 2005, White Stores specialise in the import and selling of high quality garden furniture and accessories such as Rattan sofa sets, parasols, patio heaters, sun loungers, BBQ grills, artificial Christmas trees and all-weather furniture covers. Importing 200 containers of furniture each year, White Stores have annual sales of over £5m and are also major players in the contract furniture market, supplying well-known brands such as Ascot Racecourse, Costa Coffee, Fitness First and Starbucks. White Stores already operate their own 8,000 sq ft. showroom located at the company’s headquarters in Wickford, Essex. This showroom is open 7 days a week to the general public and trade customers. White Stores are experts in promotion and sale of garden furniture, BBQ’s and accessories. Their website receives around 250k hits each month and their strategy is to encourage consumers to visit their stores by offering their extensive product range at year round competitive prices. 3000 – 5000 sq. ft. Play The Best Online Gambling Games at casinosonlinefacts.com - Claim Now $200 Bonus + $10! . PokerStars New Online Casino - visit http://www.playroulettecasino.com .